Larger than life: for both a literal and figurative translation see under ‘Deron Williams.’ Entering his high ceilinged Tribeca home is like walking onto an installation by Jeff Koons where a contemporary god wrought of cast iron and aluminum stoically stands with hands extended in greeting. 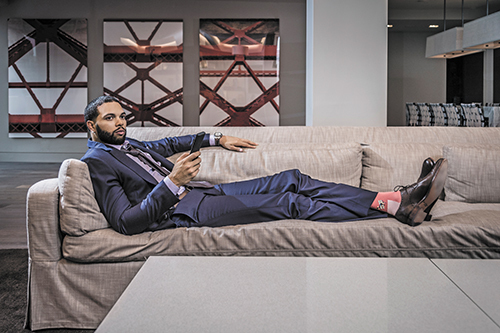 That this three-time NBA All-Star and two-time Olympic gold medalist, is as unpretentious as his (6 ft. 3 in. 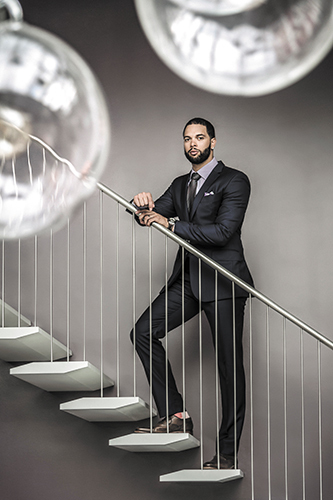 209 lb) figure is imposing, is a testament to D-Will’s integrity both on and off the court. Known as the Point Guard with a deceptively shy manner and a killer instinct, Williams is a new breed of American athlete; one who – having played for Besiktas in Turkey during the infamous 2011 NBA lockout – is familiar with societies beyond US borders and one who sees women as perfectly capable role models for boys. The latter quality is in great part due to Deron’s own mother, Denise Williams, a woman who had not only singlehandedly raised him and his younger brother, Kendall, but had been a basketball promise in her own right, having played Point Guard (!) for West Liberty State College. Moving from West Virginia to a Dallas suburb at an early age, Williams rose quickly from the ranks of gym rat to genuine contender in everything from tennis to wrestling to basketball. By high school, he’d embarked on a course that would shape his future: he’d met bride to be Amy Williams; and he started playing the game that would lead him from Dallas to the Fighting Illini (University of Illinois) to NBA’s Utah Jazz and finally to our very own Brooklyn Nets. Eschewing flashy moves, Williams is the solid player you can always count on. As a Starting Point for Utah Jazz, he was the ‘quiet conductor,’ ‘the instrument of choice,’ ‘the underlying score for scorers’ and the player most noted for his captain-like qualities. By the time Williams was traded to the NJ Nets in 2011, he had become the first in NBA history to record 20 points and 10 or more assists in 5 consecutive playoff games. Aficionados suspected they were watching the all-time best Point man. In March 2012, Williams surpassed the Nets ‘single game high’ by scoring 57 points. By July of that year, he signed a 98.7 million dollar contract to stay on. This was just as the team left Newark, moving back to NY for the first time since 1977 (the occasion prompting minority franchise owner and native Jay-Z to announce the rechristening of the Brooklyn Nets). Playing in Barclays Center, Williams was now in close proximity to Maimonides Medical Center – the team’s official hospital and as fate would have it, the very place where the son he adopted in Utah, DJ, was born. No referee, one-on-one. Ball’s in my court. Williams betrays no signs of hubris. He forgoes mentioning achievements I forget to bring up. Not one for hype or gratuitous attention, his responses are terse and marked by a desire to get the job done. You could’ve at least got my name right. It’s Denise Smith not Williams. Big Fan. Interesting how much controversy resulted from the story. Good Stuff. The story was very well done. Great things were revealed about Deron that I never knew.